Bay Witcher didn't mind giving his friend Seth Clark a hand. Clark had held down a potent Buford offense in the second game of the Georgia High School Association Class 5A state championship series. After Clark issued a two-out walk, Loganville brought in Witcher to save Clark's masterpiece. 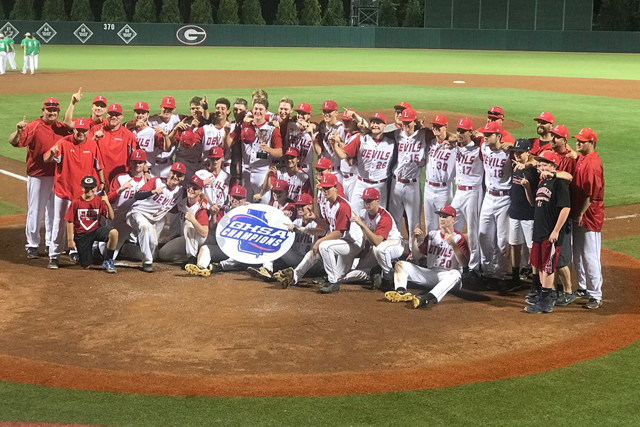 Witcher, the stocky right-hande, didn't disappoint, recording a strikeout for the final out of the game and helping Loganville win back-to-back state titles by sweeping Buford Monday night at Georgia's Foley Field in Athens. Loganville won 3-2 after routing the Wolves 13-3 in Game 1. It was the fourth state title for the Red Devils (35-6), who also broke the school record for the most wins in a season. Loganville won titles in 2008, '12 and '17. They also finished as the state runner-up in 2016 and '02. Clark allowed two runs on three hits in six and two-thirds innings, striking out seven to outduel Buford's Sean Adams. Clark got all the run support he needed in the first two innings. Bryant Pietri smacked a two-run homer in the first inning, then Ian King's RBI single in the second game gave the Red Devils a 3-0 advantage. Buford (28-13) cut into the lead with a pair of runs in the second inning on Griffin Price's RBI single and an error. But that was as close as the Wolves could get. Before surrendering the seventh-inning, two-out walk, Clark had set down nine straight. Loganville's bats erupted for a 13-3, five-inning victory in Game 1. The Red Devils got two hits each from Dylan Strickland, Witcher and Daniel Braswell. Joseph Brandon earned the victory on the mound, allowing just three runs on five hits and striking out nine to earn the victory.